Wonder why these were never thought of before,on second thoughts you are going to look a bit of a dork playing in these. 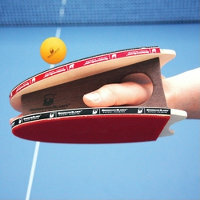 These are the table tennis paddles that are worn like mittens, effectively turning your hand into a paddle (Play Video). The mitt’s unconventional design eliminates the handle and spreads apart the front and back of the paddles, allowing your hand to slip between them. The paddle becomes a natural extension of your arm, resulting in greater ball control, faster volleys, an improved backhand, and more spin. The table tennis mittens are available from Hammacher for $99.95.